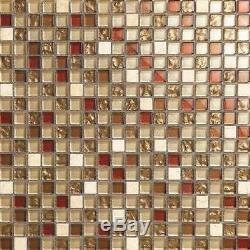 1 SQ M Cream Red Gold Silver Stone Glass Mix Bath Mosaic Wall Tiles 0065. Glass and Stone Mosaic Wall Tiles. Material: Polished glass and stone. Colour: Cream white stone and an autumn mix of red gold and silver foil glass. Suitable for bathroom and kitchen walls and ideal for making splashbacks, borders and feature walls. The mosaics tile pieces are glued onto a flexible backing making them easy to lay. The sheets can easily be cut into border and edging strips using scissors or a craft knife. These mosaic tiles can be bought as a small sample in a seperate listing in our shop. 1 sheet is 30cm x 30cm. 11 sheets make up one square meter and is the unit of measure for this listing. Each sheet contains 324 tile pieces. Tile pieces are 15mm x 15mm. Any product you return must be in the same condition you received it and in the original packaging. The item "1 SQ M Cream Red Gold Silver Stone Glass Mix Bath Mosaic Wall Tiles 0065" is in sale since Monday, September 10, 2018. This item is in the category "Home, Furniture & DIY\DIY Materials\Flooring & Tiles\Floor & Wall Tiles". The seller is "gt-rhein" and is located in Aberdare. This item can be shipped worldwide.